Last edited by GuruGuy128 on Wed Jan 23, 2019 7:37 pm, edited 1 time in total. Good it has an official home. I just ordered the Batman box online. Oh, those have been LOC boxes? I've seen them both on my last few visits to Target and thought they were just random Target exclusive boxes. Ehhh. 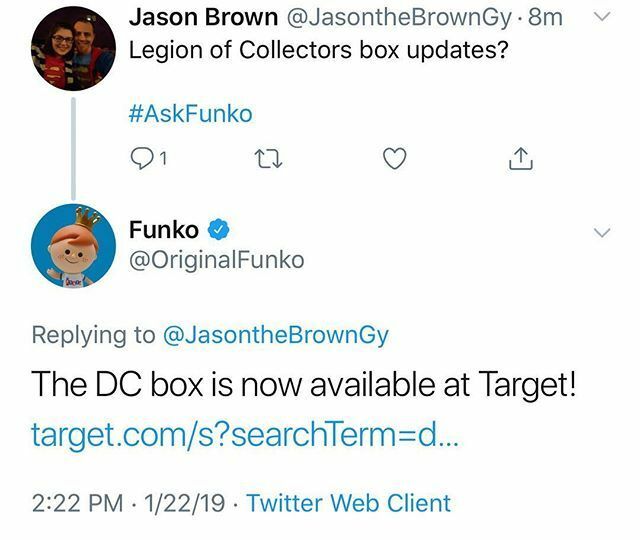 I wonder if this is funko just saving face. These were never marketed as LOC despite constant clamoring for where that box was going to end up. Now all of a sudden these were always LOC boxes...?? Sounds fishy. Oh well, no biggie either way. Glad it has a home. Shame that only one of the collector boxes is easily accessible to Canadians. Very unfortunate, Can't imagine for non continental fans. I guess we'll see fewer boxes with t-shirts since it'd be a pain to ship a run of sizes to stores.